Emilio Estevez's film The Way set on the Camino de Santiago pilgrimage route, and starring his father Martin Sheen premiered in Santiago de Compostela on 8 November 2010. Nancy was there and met them both. When I heard that Emilio Estevez’s new film, The Way, set on the Camino de Santiago pilgrimage route in Spain would be premiered in Santiago de Compostela on November 8th, I was eager to go. Starring his father Martin Sheen, Estevez wrote and directed the film as well as appears in it as Sheen’s on-screen son. I knew that in 2009 they had been filming along the route and I wondered what kind of Camino film two Hollywood notables would make. I invited my friend María Santos and off we went to the elegant 19th century Teatro Principal in Santiago´s historical quarter to find out. I have to admit it was quite a thrill to see Martin Sheen and Emilio Estevez walk the mini-red carpet surrounded by a sea of umbrellas as the rain accompanied their entrance. As we sat down to wait for the movie to begin, I realized how interesting it was to have María at my side. The Camino is something that I’ve lived and breathed for the last 18 years. María, born in the US and a daughter of Galician immigrants, knows about the Camino de Santiago but has no personal experience with it herself. How different, perhaps, our perspectives would be. When the movie began to roll I was filled with emotion as I could I identify nearly every scene, landscape, historical monument and bit of Camino. Estevez and Sheen’s angle was clear early on: It’s a movie of the heart from start to finish. 2010 has been my own personal year of the heart and so this tack resonated strongly with me. Countless times over the course of this year I’ve been reminded to listen to my heart: Let the heart be your compass. In The Way Sheen plays Tom Avery an ophthalmologist from California who becomes an accidental pilgrim when he receives the tragic news of his son’s death on the Camino. Estevez and Sheen take us on a gripping, epic journey in equal parts hilarious, deep, heart-wrenching and moving as we share the struggle of a father gripped with confusion and remorse to understand the tragic loss of his only son Daniel, a person he realizes he never really understood. Tom suddenly finds himself in Saint-Jean-Pied-de-Port, a small village in southwest France where many pilgrims start the Camino today. Impulsively, he decides to take his son’s pack and ashes and walk the 800km across Spain making the journey that his son could not. The opening scenes are very moving and set the stage for the profoundly human story of how we must each fumble along to find our own way. In the movie Tom says to Daniel before he heads to the Camino, ‘I live the life I chose. Why can’t you do the same?’ Daniel responds, ‘You don’t choose your life, Dad. You live it and that’s what I’m doing.’ The pilgrimage is a metaphor for life and the pilgrim the lost soul who finds his way back home by following his heart. Estevez (and Sheen through his inspired performance) makes you care about this lost soul and wonder how he will ever make it. Unlike other Catholic centers of worship where pilgrims often look for a cure of the body through faith, modern pilgrims to Santiago (most of whom would not define themselves as religiously motivated) frequently seek some kind of answer for life’s inner woes. The focus is on the power of the journey rather than simply reaching the destination. Many people find themselves doing the pilgrimage to Santiago and are not sure exactly why but somehow know that it is the right place to be. The contemporary pilgrimage to Santiago is very popular precisely because of its openness: there’s a place for everyone irrelevant of age, background, faith (or lack thereof) and motivation and it has a way of hitting each individual in just the right spot (even though what that spot might be can be quite a mystery). 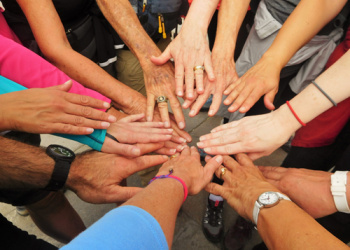 One of the common sayings among pilgrims along the Camino is that ‘You can start alone but you never end alone.’ The power of community and friendship is a theme reinforced throughout the film. Tom starts very much alone but soon acquires three unlikely companions who share his journey. As Estevez shared with me at the after-party, The Way is a modern-day Oz story as three flawed characters help Tom (Dorothy) find his way back home to his son, his heart and, ultimately, himself and his faith. The movie brings vividly to life the sights, sounds (both pleasant and annoying – in addition to a great soundtrack including Coldplay, Alannis Morrisette and James Taylor), color and feel of the Camino as we see the group of pilgrim friends share meals, sleep together in the pilgrims’ refuges, walk through the varied landscapes as well as have both good and bad encounters with locals and, importantly, with each other. Despite their conflicts, and also because of them, the pilgrims are able to have unexpected moments of liberation and insight. The Way gives us a picture of the Camino, warts and all, to show how pilgrimage is a process of trial and error, forgiveness and insight, sorrow and laughter and how pilgrims’ motivations are as varied as a rainbow from the deeply religious to personal angst to physical challenge to the apparently trivial. The characters are credible and you care what happens to them keeping you riveted until the end. Estevez and Sheen want to show how the Camino’s magic helps to work change in pilgrims – when people leave behind their normal lives and go to the pilgrimage stripped of most of their possessions, normal stress and obligations, they connect more easily with the world (ie, self, nature, God, others, body, history, etc). Unhindered by the labels, status and titles they may have back home, when the day’s obligations are reduced to the basics (walking, eating, and finding a bed), suddenly life seems much easier. As pilgrims lighten their loads mentally, they often describe how their inner worlds also free up giving way to the possibility of greater insight and self-awareness. On the Camino people describe connecting more intensely to everything around them and inside of themselves. Making the pilgrimage to Compostela helps many people discover their own way on the Way – it can be a type of mobile therapy. After the premiere I asked María her general impression of the film. Overall she was very positive but was surprised at how ‘religious’ it was. I hadn’t felt the same way. Reflecting on it more, the themes of re-finding one’s faith and connecting with something spiritual are definitely present but it seemed to me part of each person’s private story and not an imposition on the audience. Also, being a religious pilgrimage in its origin, it’s inevitable that elements of the Catholic church will be woven throughout. I think I also take for granted with my years along the Camino the incredible diversity of stories and how on the Camino it is possible to be steeped in religion yet not feel religious. Yes, religion is inevitably present throughout the film but its intention is not to prosthelytize. The moving story behind the story also involves the heart. When Emilio Estevez introduced the film to the audience he started with a quote: ‘It’s a pleasure to return from whence I came.’ He said, ‘It is the same for Martin and me. Our film is a love letter to Spain. It’s a love letter to Galicia.’ Before Martin Sheen took his stage name he was Ramón Estevez son of a Galician immigrant from Salceda near the coastal town of Pontevedra. Spain remained close to Sheen’s heart and he continued to return to his father’s native land. Seven years ago Sheen invited his family to tour Spain with him. They ended up doing their own road trip of the Camino as they crossed the north of Spain to Galicia. This journey and Sheen’s own faith eventually led them to make their own film about the pilgrimage way and transform it into a tribute to the land of their ancestors. The film is dedicated to Martin Sheen’s father. Anyone who intimately knows the Camino will find a number of odd edits of landscapes. Emilio Estevez explained to me after the premiere that his original movie was 3.5 hours long and he was required to do some creative editing. This is inconsequential to the overall feeling of the film as the scenes selected are visually rich and conjure the depth of beauty of Spain in its many facets (and at its best). They did skip the sections where pilgrims must walk along roadways or wait in lines at refuges but one would expect that type of poetic license. Also, the pilgrims themselves remain remarkably immaculate during much of their pilgrimage, they don’t seem to have any physical problems and Tom tends to charge through the whole Camino with great determination and vitality. I would have softened his pace as his character softens and evolves over the course of the journey. The development and transformation of Sheen’s character is particularly good. We see how the others are deeply touched by the Camino but I did wonder how the experience would stay with them over time. Of course, this a major interest of my own (How does the journey impact people in the long-term, if at all?) as I explored in my book Pilgrim Stories. On and Off the Road to Santiago. These are minor complaints as The Way manages to touch on and give accurate and colorful insight into a wide ranging mix of Spanish (eg, regional differences and Gypsy stereotypes) and Camino culture. There are several scenes that poke fun at Americans and there is an especially funny moment when two characters debate about the proper word to use for Spanish finger foods – tapas or pinchos – in northern Spain that brought the house down in the predominantly Spanish-speaking audience in Santiago. The film also wrestles with one of my favorite Camino topics: authenticity. One night around the fire the pilgrims debate about the nature of the ´true/authentic’ pilgrim. One side claims that real pilgrims only walk and must suffer as they did in the medieval past. Another pilgrim points out the hypocrisy in this idea of modern self-styled suffering pilgrims who travel with plenty of comforts (eg, cell phones, credit cards and waterproof shoes) unknown in the past. It’s not how you do the pilgrimage that’s important but how you carry it in your heart. Walking with your own pack is one way to do the Camino but it’s not the only way. Everyone must find their own Camino. That’s one of the central messages of the film: Nunca es demasiado tarde para encontrar el Camino. It’s never too late to find the Way/way. There’s no formula to be a ‘real/authentic’ pilgrim. It’s a real shame how many, many people today see the Camino as a competition of who is a better (ie,imagined ‘authentic’) pilgrim and get very snooty about where they started, where they stayed and didn’t stay, how far they’ve walked, how many times they’ve done it, etc as if that were the point of the Camino. What a sad outcome of a pilgrimage along the Camino de Santiago. Authenticity comes from within and isn’t found by following some unwritten code of oughts and shoulds and trying to impose it on others. Live your own life. Live your own pilgrimage. Follow your own heart. Walk your own Camino (and stay clear of anybody who tries to tell you there is a right way)! ***I’d like to thank my dear friend María Santos for accompanying me to the premiere and the post-premiere cocktail where we met the remarkably gracious Emilio Estevez and Martin Sheen. To find out when YOU can walk the Camino.....visit our 2015 Calendar! Emilio Estevez comments on Nancy’s review! Bravo! Thank you so very much for your wonderful and thoughtful review of "The Way." A love letter to a love letter, as it were! As someone who is so invested, so intimately connected to The Camino, I am both pleased and quite humbled by your remarks. Your own personal story of finding your heart-mate while on pilgrimage is yet again, another miracle of St. James!.... I truly enjoyed our meeting at the after-party and I wish you much continued success as you take pilgrims through their (literal) paces along this most extraordinary journey. I hope to one day join you, without the cumbersome crew of 50 following along with cameras, so that I might enjoy "a true pilgrims experience" along this most magical route. A road to the center of one's own being and one's own heart. Thank you, again, for your most gracious feedback! Buen Camino y Gracias!